Lots to update, I have been a bad blogger lately. I have been traveling a lot and I will use that as my excuse ha ha ;-) Weeks 5 and 6 went fairly uneventful. I was on the road for week 6 so hotel gym tread mils and bikes. I did however get to meet up with some of my twitter friends to run a track workout while in Missouri. That was a lot of fun. Although I think I enjoyed the post workout beers more! When I returned from Missouri I unpacked my bags did laundry and repacked. 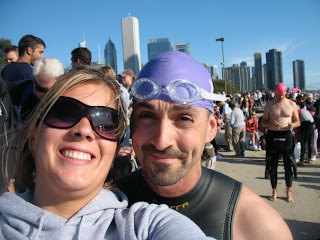 My friend Dutch, in the photo above with me, had won entry into the Chicago Triathlon from the nice folks at Polar (heart rate monitor company). I offered to hop on a plane and use all my banked hotel points to be his personal support group! So Friday morning we jumped a Southwest flight to Chicago. We had reservations at the triathlons host hotel, Hilton Chicago. It was nice. Friday night, Dutch unpacked his bike and put it back together. His nice brand new tri bike got scratched very badly by TSA- but that's a whole different story! The race expo also opened Friday night. As someone new to the sport it was a great experience. I got to walk around with other athletes and learn about coaching, buy some tri shorts, and new swimming drag shorts. I learned a lot about different fuel and shake options, my new fav... Mix1 www.mix1life.com it has a great flavor and texture- check it out! Anyway- I loved the expo's vibe and just being around other people that have the same interest as you! Saturday we scoped out the race area and transition area. And I dragged Dutch for a bit of site seeing. I only had a couple things I wanted to see in Chicago, the cloud being the main one! We walked around Millennium Park and got a great feel for the city. Then Saturday night I did a great 4 mile run around the parks again! Nice and flat and cool by the lake. I like that city a lot! Sunday morning was race day. I went with Dutch at 4am to set up his transition area. Urgh- did I want to stay in bed soooo bad! But good experience to get out there and get a feel for this whole thing. We set is all up and since his wave didn't go till 9am we went back for a nap. I slept for another hour or so and went down to the swim start with Dutch. He was all lined up and ready to go I told him I would either see him at the swim finish or the transition area. As I was standing watching the other athletes already in the water, I observed 2 things 1.) I have a serious advantage in the swim portion, most triathletes look like they are drowning in the swim and 2.) Dutch was now doing the Olympic distance event. I knew the sprint swim only went along the lake wall and he was facing the direction of the Olympic distance! I freaked out! Being his swim coach for this triathlon I knew he could do it but the swim might end up taking a lot out of him. ~for those that don't know an Olympic distance is 1.5km swim, 40km bike, and 10k run. DOUBLE the trained for sprint distance~ I knew the bike and run were going to be easy for him unless he pushed too hard on the swim. When I discovered this GIANT mistake made by the race production company, I raced to be at the fence at the swim finish! I knew I needed to get there and be sure he was okay. 45 min later he got out of the water... I screamed you are doing the international distances! He responded with "I am now!" and we both ran to transition. I yelled over the fence as he got onto his bike and was there when he came in from the bike at 1 hour 18 min. I raced to be at the transition fence again to be sure he was going to be okay for the run. I can't believe it but he did the 10 k in 50 min! He ran 8min miles! He didn't even train for this event and he KILLED IT! 3 hours and 9 minutes was the final result. I have to say as a first time triat hlete it was a great experience to be there supporting a friend.I got to enjoy the event, well kind of, my nerves were pretty shot at the end! I also, got to learn a lot of new stuff about my new found sport. It was a really cool experience. Nice post! What a crazy weekend! So glad that's over! Hey, next time you book a hotel make sure to check out http://www.HotelGymReview.com (launching soon) to make sure you stay at a hotel with a great fitness facility.